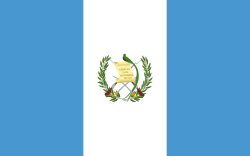 The flag of Guatemala was created in 1871. It has a vertical band of light blue (hoist-side and fly-side) and white, with the national emblem centered on the white band. This page was last changed on 5 February 2018, at 18:59.